Working Title submissions should be between 7,000-25,000 words and previously unpublished. They may be fiction or nonfiction. Novellas and translated works are welcome. For Working Titles we seek prose written for the digital page, which may incorporate unique visual, aural, or interactive elements. Formally innovative pieces of this sort are highly desired, though we welcome more traditional long prose as well. Electronic submissions are NOT accepted from May 1 to September 30. MR will accept mailed submissions for Working Titles ONLY between May 1 and September 30. Please be sure to mark your submission clearly. Because we are a very small office, it generally takes us 2 - 6 months to respond to submissions. We appreciate your patience! No. You are limited to one submission at a time. Authors must await decision notification before submitting again in the same reading period. At the time of publication, we pay a $250 honorarium for Working Titles. All manuscripts should be typed and double-spaced, and clearly marked as Working Title submissions. Submissions should include name and address on the first page of the manuscript with page numbers. 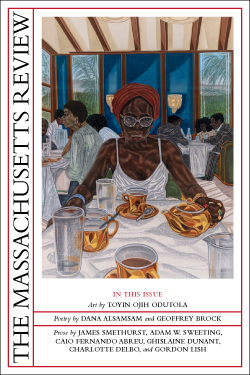 The Massachusetts Review is a non-profit journal, and it is impossible for us to acknowledge receipt of manuscripts unless a self-addressed stamped postcard is enclosed with your submission. The Massachusetts Review is not responsible for lost manuscripts. No manuscript can be returned or query answered unless accompanied by a self-addressed stamped envelope. Read this first! Make sure you are submitting on the Working Title page. All submissions should include name and contact information on every page of the manuscript. A suggestion is to include this information in the header or footer. All manuscripts should be typed and double-spaced. We strongly encourage page numbers. Multiple submissions will not be accepted. All submissions sent as attachments to any MR email address will be deleted. Please note that there is a $3.00 fee to submit electronically per reading period. The process will require a one-time account set-up per reading period. We accept Visa, Master Card, or Discover; payment is made via Commerce Manager. The electronic submission provides continuous access to check on the status of your submission. To withdraw a Working Titles submission from consideration, please email the managing editor at massrev@external.umass.edu. Should you choose to withdraw your submission for any reason, no refund will be provided.